Something VenturedSomething Ventured - Join me in real-time as I attempt to step outside the cube and build a web business. Should be good! Other than a logo, the sign-up page, and some other basic pages, it lacks any decent CSS style whatsoever. This is a bit backwards for me, but brains were scattered and deadlines had to be met, so what are ya gonna do? Awesome designers from across the globe submitting U.I. samples; amused visitors voting for the winner and providing feedback; Zack sitting in his cube feeling like he may actually have something to live for. It gives me goosebumps just thinking about it. From this day forward, the contest shall be known as Grape Skin. Do you need cheap server? The designers will be provided with “chicken-scratch” sketches of some of the U.I. screens to work their magic on and the public will choose the winner. More details about the contest (including rules, start date, and duration) will be released after sufficient interest is received. Designers and other interested parties are encouraged to sign up to participate or vote in the contest. In addition, if you are a talented developer, entrepreneur, copywriter, marketer, reporter, angel, potential sponsor, or just interested in the project and want to get involved or provide feedback, I would of course love to hear from you as well. You can all reach me by leaving a comment on this blog or sending an email to: zackjenks@gmail.com. I look forward to hearing from you. As you may recall, I hired the talented Scott Wills to design the logo and U.I. for me. He did a great job on the logo and sign-up page and he tolerated my obsessive-compulsive tendencies quite well. Regretfully, I was unable to continue on with the project and we had to go our separate ways. To give you a better idea of what GrapeShow is all about, I would like to present to you now, where we left off with the Home Page design. Thanks for your help on this Scott, it rocks! For those of you who had to sit through unbearably long wait times to view this blog, I want to thank you for your patience and apologize for the inconvenience. I am going to do my best to remedy this problem tonight! Transferring from a DreamHost basic shared account to an InMotion VPS account should do the trick. With a little luck, SomeVenture and GrapeShow will be blazing by sun up. What The Heck Is GrapeShow? As promised, it is time to reveal what GrapeShow is all about. To sum it up in two words: Video Contests. These would be very creative contests mind you with exciting prizes and connected video. It’s sort of like YouTube meets Google Maps meets Worth1000. Below is the original about page I wrote for it some time ago. I have also written a help page, a sponsor page, and a winner’s guide. 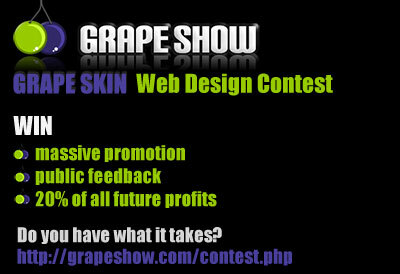 GrapeShow was conceived and built by Zack Jenks and designed by Scott Wills. It is the first of what Zack hopes to be many exciting web apps from his new start-up. We officially launched the show on November 28th, 2006, just minutes before Zack’s 30th birthday. The build process resembled something out of the hit show “American Chopper” as we worked very long hours and struggled to make our launch date. In the end though, just like the TV show, we pulled it off. We are currently based in a cozy little apartment in Portland, Oregon USA. The application was built around one very simple idea: everyone has a story to tell and every story is in some way connected. We wanted to demonstrate that in a fun and entertaining way. It began as a simple Neverending Story contest and grew from there. Our ambitious goal is to connect the world’s Grapes (videos) to one another using our unique blend of Vines (contests). Here your Grapes compete against a bunch of grapes to be part of the timeless Grapevine. 1. You can win money and other cool prizes. 2. We pride ourselves on having creative contests that allow you to compete and connect. 3. You are the writer, director, and star! 4. It’s like tagging with videos, a reverse mash-up, playing video scrabble, watching a choose your own adventure, joining hands across the world (w/ video). Whatever your take, it’s a lot of fun! 5. You might learn something in the process. 6. And, the Grapevine is calling your name. So register today. It’s free, fast, easy and allows you to take advantage of this site’s full potential. You can check out our help page for assistance getting started. Also, for more information about the building of GrapeShow, check out our blog, Something Ventured. If there is anything we can do to make your visit more enjoyable, please let us know. So there you have it. What do you think? In future posts, I’ll show you a screenshot or two of where we left off with the home page as well as the possibility of a design contest? So stay tuned. So how is this site different from any other video hosting site? Well, first of all, we’re not a video hosting site per say. We specialize in contests and bringing video together around a common theme or purpose. You can’t just submit video to us, you need to submit it with a purpose in mind and ready to compete with fellow videographers/editors to achieve that purpose. The videos on GrapeShow are not standalone products they are each part of something bigger, the Grapevine they competed for and/or the Bunch of Grapes they competed against. Whereas most video hosting sites are about a place to store your videos online, we are about connecting them. You could say that we’re where your videos come to connect and compete with one another, away from home. November 28, 2006: blah blah blah … GrapeShow … blah blah blah … failure … blah blah blah … explosion … blah blah blah … severe casualties … blah blah blah … entreprenerd robs bank … blah blah blah … prison! So, as you can see, GrapeShow went a bit sour and it turns out I am a “miserable failure” (I may have added ‘miserable’). The important thing is I don’t dwell on it <twitch>. I mean, big deal, right? So I put a crazy amount of coding and planning into this thing and never saw it through <twitch>, it’s not like it wasn’t worthwhile. It was a good experience for me <drool> and besides, you never really fail as long as you succeed at learning <massive seizure>. It turns out I am NOT Superman. With GrapeShow, I pushed myself way too hard and tried to do too much too fast. It wasn’t enough that I was inventing a semi-new product, starting a business, and keeping a full-time job on the side (see what I did there). I was also blogging it in real-time, learning a new programming framework, incorporating several new-to-me technologies, and so forth. Which is all well and good, but I was trying to do it at an insane pace and with no help (with exception of design work). I thought I could handle it, but burn-out caught up with me and the rest is history. I’ve learned to take things a tad slower now, be more flexible, get others involved, and ask for help when I need it. This is something I did a horrible job at. As mentioned above, I pushed myself to the breaking point and what’s worse I did almost nothing to help alleviate the stress. They just kept building and building until I blew my top. So I strongly encourage you to incorporate relaxation into your routine and make stress management a high priority in your life. These days I take breaks regularly, I make Sunday a non-work day (for the most part), and I have a tool kit to help me relax my mind and stay balanced. The need to thoroughly analyze my plan from every possible angle and make sure there were absolutely no holes caused me to over think things. Obsessive brainstorming and research was standard operating procedure to ensure nothing got missed. Naturally this led me to find what I believed to be potential flaws, which only drove me to more advanced obsessing, and the cycle would repeat. Eventually, when I got tired of searching for solutions to these issues, I began to tell myself that maybe I wasn’t cut out for it and I headed down the path of giving up. It never fails, I start out confident and end up chicken. The irony is, if I wasn’t so concerned about keeping myself from failing, I would probably succeed. Afterall, many of the problems I obsess over may never happen. This is something I am still struggling with but I keep telling myself to stop analyzing so much and just take the leap. The future is uncertain, get over it! A positive mindset is key! Other than that I would just add that you should be sure you are passionate about what you’re doing and committed to seeing it through. A ship is safe in a harbor, but that’s not what ships were built for. A few months back, my dad told me he was going to quit working on Sunday’s and instead take a day of rest. I remember thinking how great that was for him and how impossible it would be for me. We’re talking about an entire day that could be spent working on building the business here. So I carried on working two hours every week night and eleven hour days every weekend. It was up at 5 am and work work work all day long. And we’re not talking the whistling kind of work, we’re talking veins shooting out of my forehead. My entire world was business and nothing else mattered. No time for family and friends, exercise, eating decent meals, cleaning up, sleeping in, or having a split second of fun. My eye was looking through a narrow tunnel at the prize and I could not allow myself to lose momentum. I could not fail! Everything and everyone I care about was outside this tunnel as I pushed myself to reach the other side. My stress levels were sky high, I was completely miserable, and a couple weeks ago I finally crashed! For a good visual, picture me rocking back and forth in the fetal position, sucking my thumb, as you repeatedly kick me in the groins while laughing at my girlish figure. I crashed pretty hard! Now the crash has subsided and I am in the process of picking myself up off the floor and rebuilding, which makes me a bit like the Six Million Dollar Man, only on a much tighter budget. The passed week I’ve been reading the book Stress Management for Dummies which my girlfriend bought me a while back but ironically I was always too busy and stressed out to read. After taking one of the tests in the book and finding my stress levels to be in the EXTREME range, I realized it was time for a change. I had to ask myself: is the business that important? Is it worth killing myself over? Is it worth giving up everything good around me? Obviously it isn’t and now I am taking steps to relax and de-stress myself on a regular basis. My eyes have been opened and my surroundings are becoming visible again. Stress levels are getting back to the comfortable green zone and my mind is clearing up. Now that things are in perspective and my priorities are back in line, the business is really not as important as I once thought. It used to be everything, now it’s just something. Not to say I won’t continue to go after it because I will, just at a lesser intensity. Future happiness is not worth killing myself today. I guess I’ve had a bit of an epiphany and am realizing that I take myself and life in general way too seriously. I take little pleasure in the little things in life and my expectations are off the charts. It’s time for me to start enjoying life again and have some fun. Take up some new hobbies, travel more, spend more time with family and friends, and basically just live a little more. This isn’t to say my ambition and business dreams are going to die out, far from it. It just means I’ll be taking my expectations down a notch and finding a better balance between my business and personal life. It’s time to appreciate the space between a bit more. It’s time to spend a little more time in the present and a little less in the future. Not just for me but for the business as well. I’ve found that putting too much of myself into the business actually hinders potential for success. It makes me miserable and reduces the quality of my work. It robs me of inspiration, motivation, and creativity. Taking breaks from the business and getting out in the world will open up doors of possibility for me and who knows what/who I’ll find out there to help me fly this thing. Long story short, I’ve decided to follow my dad’s lead and take breaks from the weight of the world more often. Sundays are now a work-free zone around here as it is going to take a strong and healthy Zack to build a strong and healthy business. The trickiest part is going to be finding that balance between an ambitious, work-a-holic, stress cake focused completely on the future and a fully content, happy go lucky, carefree hippy living completely in the here and now. Wish me luck. …and you’ll find my corpse! I’ve been running myself ragged trying to get GrapeShow released, as promised, while I’m young. Ironically, it’s aged me quite a few years in the last few months and I’ve got the grey hairs to prove it. The passed couple weeks have been very high stress around here! Every day I watch the timer count down closer to launch date and my anxiety climb up closer to heart attack. There’s so much to do and so many bases to cover that it’s incredibly easy to get overwhelmed. After pushing myself to the absolute breaking point and trying to accomplish everything at once, the inevitable burn out has kicked in. Starting a web business is no small matter and as dedicated and determined as I am, the self doubt and exhaustion is starting to get the better of me. It wouldn’t be so bad in a vacuum, but coupled with a day job and trying to meet deadlines there as well, it can get a tad hectic. My brain is all across the board these days. One minute a coder, the next a designer, the next a creative and/or technical writer, and the next a business man. I’m starting to see why they recommend at least a party of three when building a web app. Since I don’t have that, the deadline will once again need to be pushed. That’s what deadlines are for though, right? Am I right folks? By far the biggest lesson I’ve learned lately is never EVER countdown a web app!!! Sure, it might seem like a good way to stay motivated and draw in a crowd (or at least it did to me) but it can back fire big time. First of all, there are way too many variables the first time around to accurately predict how long it will take. Secondly, it has raised my stress levels immensely and not in a good, motivating way. It did motivate me initially, but setting it too aggressively has caused me to go completely sideways. Needless to say I’ve killed the countdown indefinitely. I will continue to put 110% into this and keep you updated on the progress, but will never again (at least not until I know what I’m doing) publicly announce a definitive launch date. I’m not saying deadlines aren’t a good thing because they clearly are. I have a new one in place but plan to keep the specifics private except to say that it should be happening in the next couple months. In reality, this thing is going to take as long as it needs to take to do it right. But know this, it is definately coming soon! Here’s a few checkmarks that have been completed, or close to it, since we last spoke: account with Dreamhost setup, copy written (about, help, tagline, etc. ), and home page designed. I’ve decided to take a break over Thanksgiving and try to forget about the business for a weekend. Hopefully the burn-out will subside and I can hit the ground running, or rolling as the case may be after this weekend. Hope you all have a great Thanksgiving! Well the sign-up page is anyhow and it’s pretty exciting! Feel free to sign-up to be first notified on launch day. So, what do you think? I’m very pleased with how this turned out and I want to congratulate Scott on a job well done. And, now you know the name, any idea what it is? I’m a bit curious myself. Some sort of social networking application for drunken wino’s perhaps? Who knows, but progress is definitely being made I can tell you that, and I’ll be briefing you all shortly with more details. Just wanted to get the logo and sign-up page on here for you guys to check out. Join me in real-time as I attempt to step outside the cube and build a web business. Should be good!